Welcome to Season Four of The MJCast! After a long (but much-needed!) winter break, hosts Jamon and Q are excited to be back to discuss everything that’s been happening in the world of Michael Jackson and the Jackson family, and to look ahead to the year to come. The guys kick things off by discussing Paramount Network’s Lip Sync Battle: Michael Jackson Celebration, Paris Jackson’s ‘soundtrack to her life’, and the Kickstarter campaign for the Moonwalkers documentary, which explores the world of MJ tribute artists. And, looking ahead to events happening in 2018, British fans can check out the London Portrait Gallery’s ‘On the Wall’ exhibition, while fans around the world can see The Jacksons, who have announced new concert dates, and 3T, who will be attending the 5th Annual MJ Day in Paris on August 29th, as well as performing on September 1st. Plus, Janet Jackson will perform alongside MJ luminary Teddy Riley at the Essence Festival happening this July. To round this segment of the show out, Q offers a touching reflection on the late MJ fan, Mustafa. As they launch this new season, Jamon and Q also have some exciting announcements. Going forward, the team is expanding with correspondents, several of whom you’ve heard on previous episodes. They will be the official reporters on particular aspects of MJ news, history, and the fan community, and will be involved in episodes regularly. 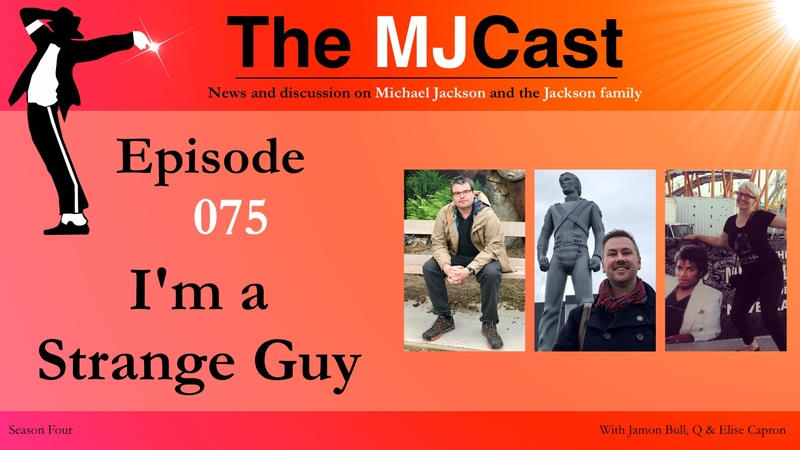 Two featured correspondents on this episode include Steven Hodges of Michael Jackson Fans For Charity (MJFFC) and Janneke van der Linden of Jackson Source. And, the team is pleased to announce that Elise Capron has joined The MJCast as Web Assistant. Her work will be focused around shownotes, and you’ll also be seeing her on social media, so feel free to say hi! Elise tells her fan story and talks a bit about the market for MJ-related books. Plus, Q covers his recent visit to the MJ HIStory statue in the Netherlands, and his visit with Janneke van der Linden of Jackson Source. This entry was posted in The MJCast, Uncategorised and tagged 3T, Anthony King, Brandy, Charles Thomson, CJ DeVillar, Elise Capron, Essence Festival, Gringo, In The Closet, It's Not Worth It, Italy, Jaafar Jackson, Jackson Source, Janet Jackson, Janneke Van Der Linde, Joseph Vogel, Kickstarter, Lip Sync Battle, London, London Portrait Gallery, Michael Jackson, Michael Prince, MJ Day, MJ Fans for Charity, Moonwalk Talks, Moonwalkers, Mustafa, On The Wall, Paramount Network, Paris Jackson, podcast, Q, Reason Bound, Ride With Me, Single White Glove, Steven Hodges, The Jacksons, Workin' Day and Night by Elise Capron. Bookmark the permalink.